This common and sometimes abundant wetland species occurs throughout England and Wales, in Scotland it is a local, southern species mostly from lowland coastal areas and the Western Isles (Luff). 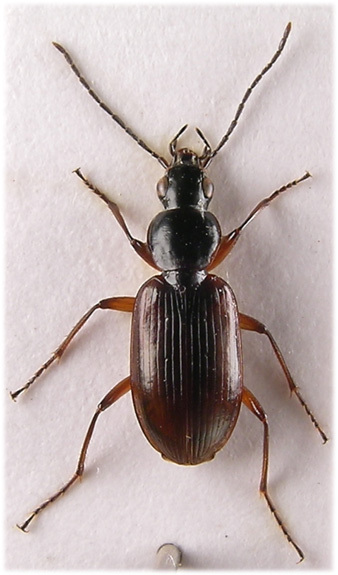 They occur throughout our Watford area and are active between March and August or September depending on season although occasionally adults turn up in samples of waterside vegetation etc. earlier or later than this. In early spring they are sometimes active on moist, bare clay or silt in warm sunshine along with other carabids but generally they keep to wet soil among dense vegetation beside standing or running water eg a large population has been present betwen 2006 and 2009 among marginal reed litter at Radlett road. Pitfall trapping in such places will invariably produce the species. They are also , or perhaps mostly, active nocturnally and easily found by torchlight in suitable habitats although they often occur among large populations of Paranchus albipes (etc) and so will need to be looked for very carefully. During April and May we often find them under debris (especially logs) on wet, but not waterlogged, ground sometimes far from an obviously suitable habitat. The species is fully winged although we have not taken it in flight or at MV light, and breeds during the spring and summer (Luff). 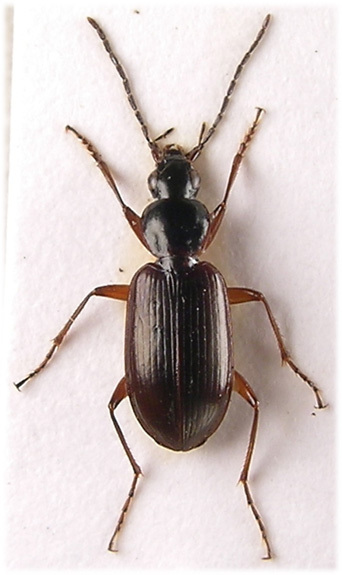 A.thoreyi occurs in two colour forms; puellum Dejean has the upper surface almost entirely black or dark brown or sometimes with the elytra a little lighter, thoreyi s.str. has a pale yellow to brown elytra which is generally darker along the suture. Puellum is more frequent in the north. 6-8mm. Head with two setiferous punctures beside eyes, frontal furrows vary; generally weakly impressed, elongate and with various lateral depressions. Head in female dull due to granulate microsculpture which is obvious at X20, in male shiny, microsculpture barely suggested. Antennae black with basal segment brown (lighter in thoreyi s.str. ), pubescent from apical half or two thirds of third segment, inserted on side of head before eyes. Palps without setae, brown with apex of segments lighter, terminal segment elongate and well developed. 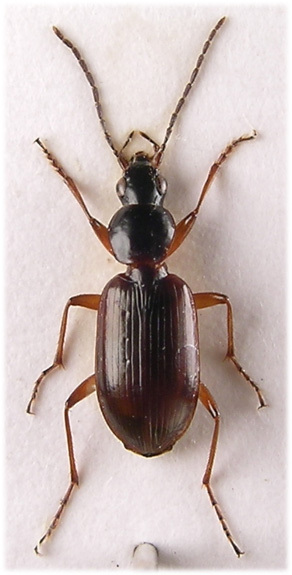 Pronotum distinctly narrower than elytra, quadrate and broadest at or before middle. Lateral margins not, or only slightly, explanate, strongly bordered and evenly curved to rounded hind angles. Front angles rounded and weakly protruding. Basal fovea variable; elongate, shallow and weakly defined. Surface smooth and shiny in both sexes. Microsculptured only anteriorly, lateral margins sometimes light in colour. Elytra glabrous, microsculpture isodiametric (X50), with 2 or 3 weak punctures on second and third striae (sometimes missing) and a stronger setiferous puncture at base of sutural stria. Striae weakly impressed and interstices flat. Side margin sinuate before roundedd apex, epipleurs not crossed, Legs red with femora darkened apically. Protibiae only moderately widened anteriorly, strongly 'notched' inside and with a single apical spur internally. Tarsi glabrous above, segments in both sexes with a longitudinal median furrow. Claws smooth.